The untold story of Peter Piper's Peppers: peppers can be hard to grow! Growing your own peppers makes perfect sense if you are a gardener. Whether you chop, dice, roast, stuff, pickle, grill or dry the brilliant colored vegetable, they are handy to have in your kitchen. You may have wandered the farmers market or supermarket and noticed they are a little pricey! Maybe Peter Piper knew growing peppers was problematic. Warm soils: If you plant peppers too early they will grow extremely slow. If night temperatures drop to the low-mid 50's they will let their discontent be known by slowing down growth, leaves may turn yellow and flowers will drop. 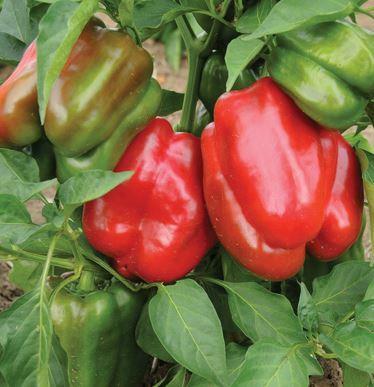 Fertile soil: Peppers prefer soil with moderate fertility and high organic matter. You won't regret adding a scoop of compost to the planting station. You can also use a starter fertilizer when first transplanting and apply additional fertilizer around the base of the plant after the first round of peppers is set. Remember phosphorus is the nutrient to thank for setting flowers which lead to fruit. Phosphorus (P) the middle number on a bag of fertilizer (12-10-5). Consistent moisture: Well-drained soil with plenty of moisture is best for growing peppers. Extreme fluctuation in wet/dry soil can lead to blossom end rot. Lack of water during early plant growth can also cause slow growth after transplanting. Ideal temperatures: Extreme heat with or without wind may prevent fruit set. Nights with temperature above 70 degrees can cause flowers to drop. Even with the greenest of thumbs you may still have difficulty growing peppers. Perhaps peppers deserve the same or more bragging rights as the first tomato of the season! Who knew that peck of pickled peppers was so hard won at Peter's Pepper Patch.